Frankfurt/ Leipzig, Germany, 26.09.2018. Until now, the Arctic tundra has been the domain of low-growing grasses and dwarf shrubs. Defying the harsh conditions, these plants huddle close to the ground and often grow only a few centimetres high. But new, taller plant species have been slowly taking over this chilly neighbourhood, report an international group of nearly 130 biologists led by scientists from the German Centre for Integrative Biodiversity Research (iDiv) and the German Senckenberg Biodiversity and Climate Research Centre today in Nature. This has led to an overall increase in the height of tundra plant communities over the past three decades. 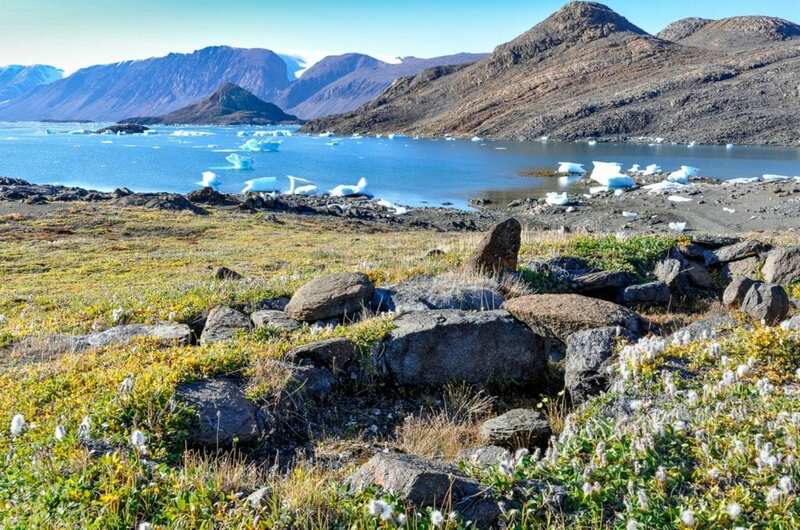 The study, initiated by a team of researchers supported through the German Centre for Integrative Biodiversity Research (iDiv), analysed the most comprehensive data set on plants in the Arctic tundra available. The study encompassed almost 120 tundra sites, most of them located in Arctic regions of Alaska, Canada, Iceland, Scandinavia and Siberia. "The increase in height we saw was not just in a few sites but nearly everywhere," says lead author Dr Anne Bjorkman, who now works at the Senckenberg Biodiversity and Climate Research Centre and who conducted the study at the iDiv research centre, the University of Edinburgh, and Aarhus University. A detailed analysis showed that not only do individual plants grow taller with warmer temperatures, but that the plant community itself has also shifted. "Taller plant species, either from warmer pockets within the tundra or from southern areas, have spread across the tundra", says Dr Nadja Rüger, a scientist at the German Centre for Integrative Biodiversity Research (iDiv) and at Leipzig University and a co-author of the study. This move is far from over, as Bjorkman points out: "If taller plants continue to spread at the current rate, the plant community height could increase by 20 to 60% by the end of the century." Surprisingly, the researchers found no evidence that this "invasion" of taller species is currently leading to a decline in shorter species. Arctic regions have long been a focus for climate change research, as the permafrost underlying tundra vegetation contains one-third to half of the world's soil carbon. When the permafrost thaws, greenhouse gases could thus be released. An increase in taller plants could speed up this process as taller plants trap more snow in winter, which insulates the underlying soil and prevents it from freezing quickly and deeply in winter. "Although there are still many uncertainties, taller tundra plants could fuel climate change, both in the Arctic and for the planet as a whole", Bjorkman concludes. The researchers conclude that the response of the plant community as a whole to climate warming will depend on whether the tundra becomes wetter or drier over time. Rüger says: "In order to predict how the plant community in the tundra will react in the future, it is necessary to not only take into account alterations in temperature, but also in water availability. If precipitation or the water cycle change, or if the timing of snowmelt shifts, this may have severe effects on the tundra vegetation." Anne D. Bjorkman, Isla H. Myers-Smith, Sarah C. Elmendorf, Signe Normand, Nadja Rüger, Pieter S. A. Beck, Anne Blach-Overgaard, Daan Blok, J. Hans C. Cornelissen, Bruce C. Forbes, Damien Georges, Scott J. Goetz, Kevin Guay, Gregory H. R. Henry, Janneke Hille Ris Lambers, Robert D. Hollister, Dirk N. Karger, Jens Kattge, Peter Manning, Janet S. Prevéy, Christian Rixen, Gabriela Schaepman-Strub, Haydn J. D. Thomas, Mark Vellend, Martin Wilmking, Sonja Wipf, Michele Carbognani, Luise Hermanutz, Esther Lévesque, Ulf Molau, Alessandro Petraglia, Nadejda A. Soudzilovskaia, Marko J. Spasojevic, Marcello Tomaselli, Tage Vowles, Juha M. Alatalo, Heather D. Alexander, Alba Anadon-Rosell, Sandra Angers-Blondin, Mariska te Beest, Logan Berner, Robert G. Björk, Agata Buchwal, Allan Buras, Katherine Christie, Elisabeth J. Cooper, Stefan Dullinger, Bo Elberling, Anu Eskelinen, Esther R. Frei, Oriol Grau, Paul Grogan, Martin Hallinger, Karen A. Harper, Monique M. P. D. Heijmans, James Hudson, Karl Hülber, Maitane Iturrate-Garcia, Colleen M. Iversen, Francesca Jaroszynska, Jill F. Johnstone, Rasmus Halfdan Jørgensen, Elina Kaarlejärvi, Rebecca Klady, Sara Kuleza, Aino Kulonen, Laurent J. Lamarque, Trevor Lantz, Chelsea J. Little, James D. M. Speed, Anders Michelsen, Ann Milbau, Jacob Nabe-Nielsen, Sigrid Schøler Nielsen, Josep M. Ninot, Steven F. Oberbauer, Johan Olofsson, Vladimir G. Onipchenko, Sabine B. Rumpf, Philipp Semenchuk, Rohan Shetti, Laura Siegwart Collier, Lorna E. Street, Katharine Suding, Ken D. Tape, Andrew Trant, Urs A. Treier, Jean-Pierre Tremblay, Maxime Tremblay, Susanna Venn, Stef Weijers, Tara Zamin, Noemie Boulanger-Lapointe, William A. Gould, David S. Hik, Annika Hofgaard, Ingibjörg S. Jónsdóttir, Janet Jorgenson, Julia Klein, Borgthor Magnusson, Craig Tweedie, Philip A. Wookey, Michael Bahn, Benjamin Blonder, Peter M. van Bodegom, Benjamin Bond-Lamberty, Giandiego Campetella, Bruno E. L. Cerabolini, F. Stuart Chapin III, William K. Cornwell, Joseph Craine, Matteo Dainese, Franciska T. de Vries, Sandra Díaz, Brian J. Enquist, Walton Green, Ruben Milla, Ülo Niinemets, Yusuke Onoda, Jenny C. Ordoñez, Wim A. Ozinga, Josep Penuelas, Hendrik Poorter, Peter Poschlod, Peter B. Reich, Brody Sandel, Brandon Schamp, Serge Sheremetev & Evan Weiher (published on 26 September 2018): Plant functional trait change across a warming tundra biome. Nature. Doi: 10.1038/s41586-018-0563-7. iDiv is a research centre of the Deutsche Forschungsgemeinschaft (DFG). iDiv is a central facility of the University of Leipzig within the meaning of Section 92 (1) of the Act on Academic Freedom in Higher Education in Saxony (Sächsisches Hochschulfreiheitsgesetz, SächsHSFG). It is run together with the Martin Luther University Halle-Wittenberg and the Friedrich Schiller University Jena, as well as in cooperation with the Helmholtz Centre for Environmental Research – UFZ. The following non-university research institutions are involved as cooperation partners: the Helmholtz Centre for Environmental Research – UFZ, the Max Planck Institute for Biogeochemistry (MPI BGC), the Max Planck Institute for Chemical Ecology (MPI CE), the Max Planck Institute for Evolutionary Anthropology (MPI EVA), the Leibniz Institute DSMZ-German Collection of Microorganisms and Cell Cultures, the Leibniz Institute of Plant Biochemistry (IPB), the Leibniz Institute of Plant Genetics and Crop Plant Research (IPK) and the Leibniz Institute Senckenberg Museum of Natural History Görlitz (SMNG).